Q: Is former FBI Deputy Director Andrew McCabe’s net worth $11 million? A: A questionable website cited that figure, saying it “may or may not be the reality.” McCabe’s spokeswoman says the claim isn’t true, and we found no evidence to suggest otherwise. Is fired FBI former deputy director Andrew McCabe’s net worth really $11 million dollars? If so is there any legal reasonable explanation for so much wealth accumulation such as inheritance, very lucky investments or winning a lottery? McCabe, who stepped down from his position as FBI deputy director earlier this year, was fired by Attorney General Jeff Sessions on March 16 a few days before his official retirement, after 20-plus years at the FBI. Since McCabe’s firing, several readers have asked us about a viral claim that his net worth is $11 million, some saying they saw the claim on Facebook and another crediting “the guy sitting next to me in Starbucks.” Some wondered how he amassed that wealth on a federal salary. We caution readers to consider the source when evaluating information, and in this case, the likely original source contains several red flags that warn its content isn’t reliable. In addition, McCabe’s spokeswoman, Melissa Schwartz, told us the claim is “absolutely not true.” And we found no evidence that would support the $11 million figure. That disclaimer goes on to say that readers with “credible information” about inaccuracies in the site’s post should “kindly let Finapp know” through an email address. But messages we sent to that address bounced back as undeliverable. Finapp.co.in disclaimer: The Andrew McCabe Net Worth details are being posted/updated after conducting reasonable research. It is being reiterated that the Andrew McCabe Net Worth details mentioned here are only ‘estimates’ which may or may not be the reality. While utmost care is taken by FinApp during the compilation of Andrew McCabe Net Worth information to ensure that the estimated net worth is closer to the reality, FinApp shall not assume any liability or responsibility for the outcome of decision(s) taken as a result of any reliance placed in this post. Further, if any of the readers have a credible information about any inaccuracy in the data posted here on Andrew McCabe Net Worth, they may kindly let Finapp know about the same through an email to mail@finapp.co.in. Changes shall made based on such information after reasonable due diligence from FinApp’s side. The site gives figures for cars, houses and income that, even if true, would only add up to about half the net figure it cites — and income isn’t completely part of net worth. A person’s net worth is the value of assets — including property, stocks and bank accounts — minus liabilities, such as loans. Only the portion of income that becomes an asset — whether saved, invested or used to buy an asset — would be part of a net worth calculation. We called the phone number listed in the FinApp site’s domain registration, but that led to a voicemail that wouldn’t accept any more messages. And we emailed the person who registered the site, but we haven’t received a response. We obtained McCabe’s 2017 public financial disclosure report from his legal team. While such reports include some financial information, they do not measure net worth. The Office of Government Ethics 278 reports give ranges for the values of assets and liabilities, and not everything that someone owns or owes has to be disclosed. For instance, a personal residence isn’t included as part of assets and income, or liabilities, “unless it was rented out during the reporting period,” the report says. And the range for the value of an investment account can be $250,001 to $500,000, with no way of knowing whether the actual value is near the low or high end of that spectrum. McCabe’s wife, Dr. Jill McCabe, is a physician, and her employment is listed in the report but not the amount of her salary, which isn’t required to be disclosed. What we can glean from the report is that McCabe has several mutual fund accounts, including 529 college savings accounts and a 401K retirement fund, with the total value of those investment accounts ranging from $287,000 to $880,000. The report doesn’t list any income-generating real estate properties. We asked McCabe’s spokeswoman whether he “owns two real estate properties that he has inherited from his mother,” as the finapp.co.in post claims. Schwartz told us that McCabe said his mother and father are alive and living in the only house they own, and that the only home he owns is his personal residence. 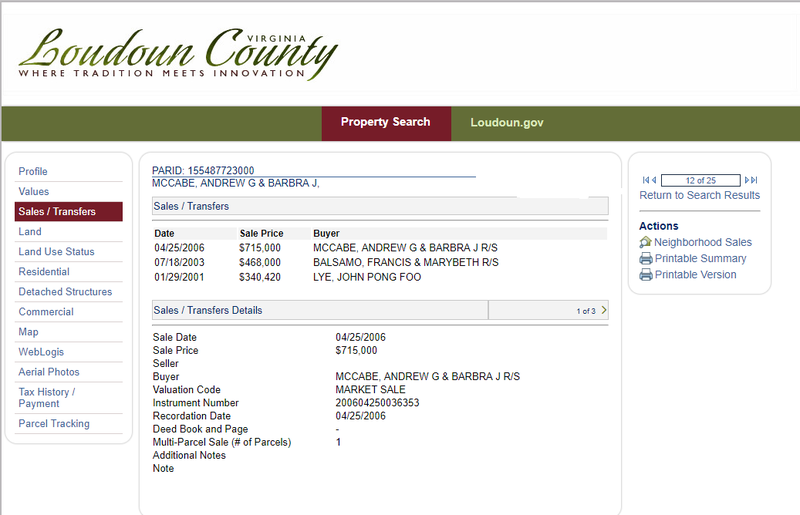 McCabe and his wife purchased that home in 2006 for $715,000, according to Loudoun County, Virginia’s sales and tax records. Schwartz specified that the home was purchased with a mortgage. In short, we did not find any support for the claim that McCabe is worth $11 million. Interestingly, in 2013, former FBI Director James Comey disclosed his own net worth was more than $11 million when he was going through the Senate confirmation process. One last note: Rush Limbaugh’s comments on this may have left some with the impression that the information on McCabe’s net worth came from a new book by Peter Schweizer, “Secret Empires,” which details business deals made by family members of politicians. Limbaugh says, “And the source for this is Peter Schweizer’s new book about people in the establishment who show up of average means and end up leaving as millionaires, how they do it. And one couple that he investigates, Mitch McConnell and his wife.” Senate Majority Leader McConnell and his wife, Secretary of Transportation Elaine Chao, are in the book, but McCabe is not. The index of the book and a search of the Kindle version show no mention of McCabe. But Limbaugh then turns back to McCabe, and the transcript of the show links to finapp.co.in as the source: “But Andrew McCabe, according to this, has a net worth of $11 million,” Limbaugh says. Jarrett, Laura and Brown, Pamela. “Ex-FBI Deputy Director Andrew McCabe is fired – and fires back.” CNN.com. 17 Mar 2018. The Rush Limbaugh Show. “The Drive-Bys Lied, McCabe Didn’t Lose His Pension.” 19 Mar 2018. “Andrew McCabe Net Worth (House Cars Salary 2018).” finapp.co.in. accessed 26 Mar 2018. Whois. Domain information for finapp.co.in. accessed 29 Mar 2018. Charles Schwab. Your Personal Net Worth. Schwab MoneyWise. accessed 29 Mar 2018. McCabe, Andrew. Public Financial Disclosure Report (OGE Form 278e). Annual Report 2017. Schwartz, Melissa, spokesman for Andrew McCabe. Interview with FactCheck.org. 29 Mar 2018. Loudoun County, Virginia. Property Search, Sales/Transfers. loudoun.gov. accessed 29 Mar 2018. Cratty, Carol and Johns, Joe Johns. “FBI nominee reports net worth tops $11 million.” CNN.com. 8 Jul 2013. Schweizer, Peter. “Secret Empires: How the American Political Class Hides Corruption and Enriches Family and Friends.” Harper. 2018.